Ares Games will present for the first time at Gen Con 2018 (Booth #335, August 2-5, Indianapolis) a preview of the upcoming Battlestar Galactica – Starship Battles, miniature game. Based on the Battlestar Galactica™ TV series, the game is scheduled to be available at the end of 2018. At the show, visitors will also be able to play with the upcoming Wings of Glory – Tripods & Triplanes. In addition to these previews, new games also release at the show: the board game of galactic conquest Master of the Galaxy and new expansions for the Sword & Sorcery line – the Hero Packs Krogham and Samyria and the third campaign set, Darkness Falls. Players will also have a chance to take a look at the new expansion for This War of Mine: the Board Game – Tales from the Ruined City (scheduled to release in November 2018), and to play recent releases with the assistance of the Ares demo team: the epic strategy game Hannibal & Hamilcar: Rome vs Carthage; the thrilling card game Monsters vs. Heroes – Victorian Nightmares; two new games published by Pendragon and exclusively distributed in North America by Ares – Hexemonia and Waterloo: Enemy Mistakes. At Ares’ booth, visitors will find several exclusive promo items offered together with purchases at the booth, including the alternate “Frodo” promo card for Hunt for the Ring, the mini-expansion “TV Set" for This War of Mine: the Board Game, the promo pack “Chaos in Hadria" for Age of Thieves, the promo cards “Necronomicon” and "H.P. Lovecraft" for Stay Away, and “Bubi” for Last Friday. In addition to the activity at the booth, Ares will also be present in the Events Hall A, from Thursday to Saturday, with lots of Wings of Glory WW1 and WW2, Sails of Glory, Sword & Sorcery events, and open gaming with all the great titles by Ares and our partners Galakta and PHALANX. If you are at GenCon, register for one of our events today! 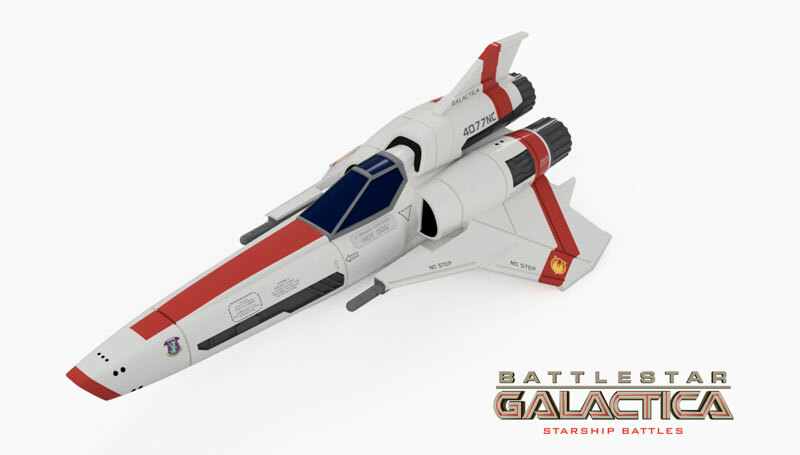 Battlestar Galactica - Starship Battles: pre-production rendering of the Viper Mk.II. 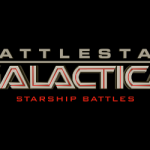 Battlestar Galactica – Starship Battles is a combat miniature game based on the Battlestar Galactica™ TV series, including both the “Classical” and “Reimagined” settings. Players will take control of Colonial and Cylon spaceships and face each other in furious dogfights and daring missions, piloting beautiful pre-assembled and pre-painted miniatures, faithfully representing the spaceships from both the Re-imagined and Classic versions of the shows. Designed by Andrea Angiolino (Wings of Glory, Sails of Glory) and Andrea Mainini (Sails of Glory), the game uses a unique game system, inspired by its “glorious” predecessors, but at the same time featuring many new features, to represent the cinematic, yet realistic space battles of the show. Battlestar Galactica – Starship Battles will be first presented to the public at Gen Con 2018, in a demo table with pre-production samples. The game will release at the end of the year, with a Starter Set and the first two Spaceship Packs – Viper Mk. II and Cylon Raider. 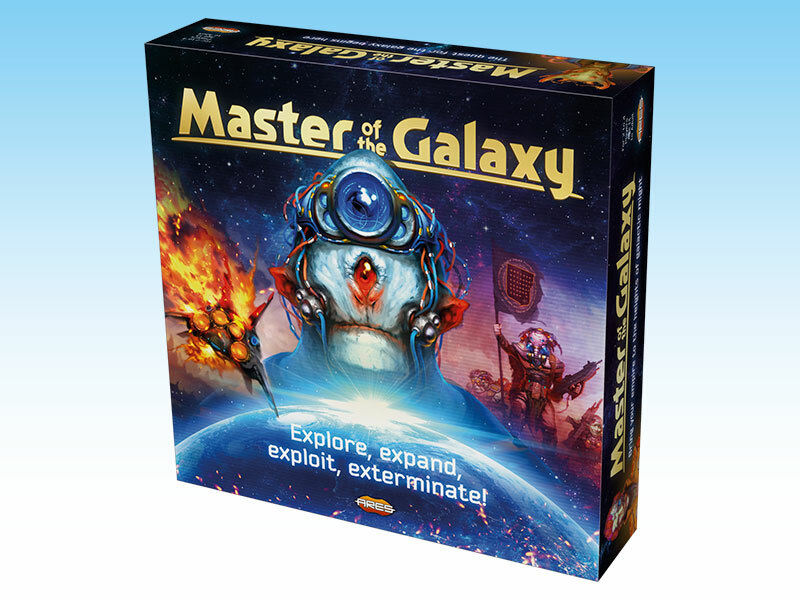 Master of the Galaxy: a fast-pacing, innovative 4Х board game. 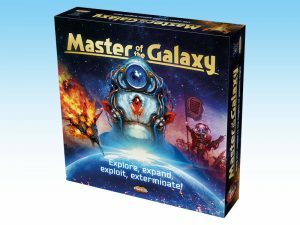 Master of the Galaxy - A fast playing 4Х board game for 2 to 4 players, ages 12 and up, Master of the Galaxy presents a unique and innovative blend of bag-building, card-drafting, and tech-tree development mechanics, inspired by classic science-fiction, movies and computer games. Nine Elder Races are expanding through space, ready to assimilate or exterminate anybody who stands in their way. Players are challenged to conquer the Galaxy, starting with one-star system, one Species card, and a modest supply of resources. Players can choose different ways to dominate the Galaxy - trying to quickly spread their people across the stars, developing science to a level unreachable by the opponents, or embarking on a methodical extermination of the rivals. A complete game requires 1 to 2 hours, depending on the number of players. 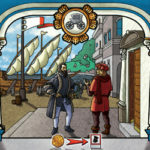 The game was funded with a Kickstarter campaign and will be in distribution just after the KS fulfillment is completed. 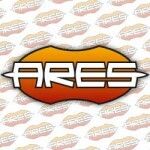 At Gen Con, Ares will have the first copies of the retails edition for sale. 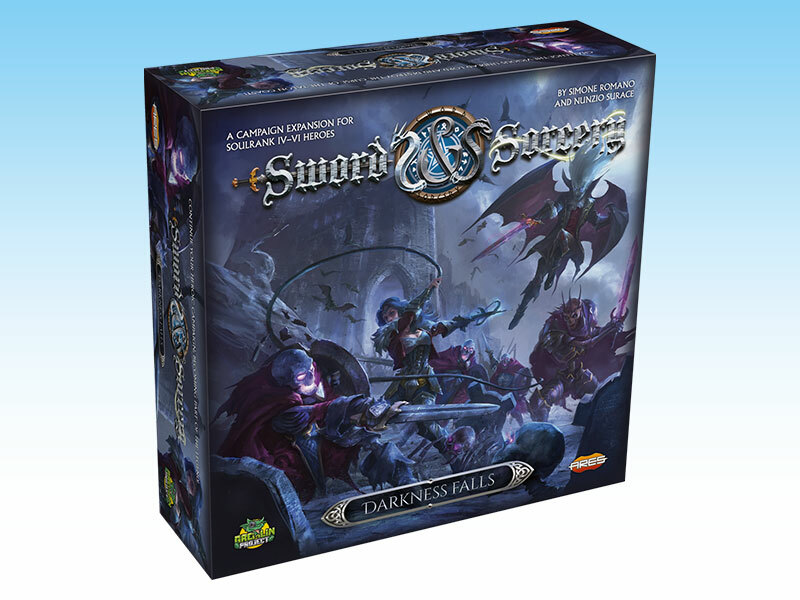 Darkness Falls: second campaign expansion for Sword & Sorcery. 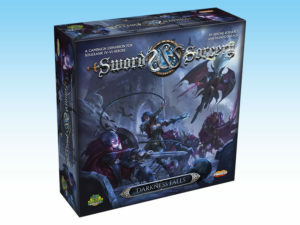 Sword & Sorcery Darkness Falls – In this second campaign expansion for Sword & Sorcery Immortal Souls, the heroes’ path brings them toward their final destiny. 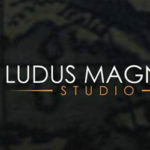 Players are challenged to complete the heroes’ epic campaign across the quests of this expansion, recreating the final act of their legendary saga. High soulrank powers, treasures, and challenging enemies await you! 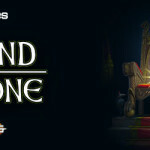 Be prepared for the most intense and glorious experience in the Sword & Sorcery lands! Darkness Falls includes 20 new lethal enemies: Succubi, Skeletons, Death Knights, and Werewolves, two new,powerful master enemies, 14 new modular boards, new Act II cards for items, traps, treasures, events and enemies. The campaign is played through seven new high-level quests, using the innovative combination of Storybook, Book of Secrets and cards to create a challenging, story-driven climax to the Immortal Souls campaign. This expansion will pre-release at Gen Con with a limited number of copies arriving at the show. It will be in distribution by September 2018. Sword & Sorcery Kroghan and Samyria Hero Packs - The world of Sword & Sorcery always needs new heroes, and the Hero Packs introduce new, powerful characters into the game. Following the four Hero Packs already released - Onamor, Victoria, Morrigan and Ryld, two new characters debut at Gen Con – Kroghan and Samyria. Kroghan is the fiercest warrior of his Clan of the Northern Lands and can be played as either a Barbarian or a Dreadlord. As a Barbarian, Kroghan is an example of extreme courage, a champion who gathers heroes under his guidance and leads them into battle. As a Dreadlord, he is a cold-blooded and remorseless warrior, a dreadful champion. Samyria is daughter of the Earth, bear–friend and skin–changer. She can be played as either a Druid or Shaman. As a Druid, Samyria is able to control the forces of nature, summoning grasping roots from the ground and ultimately changing her body into a gigantic Grizzly. As a Shaman, she calls and interacts with all the spirits of Otherworld. She can control the battlefield by creating soul totems and commanding Bjorn, her valuable Grizzly companion. 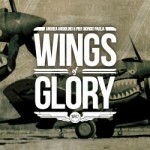 Wings of Glory - Tripods & Triplanes – A new setting for Wings of Glory, the best-selling airplane miniature. Tripods & Triplanes introduces a new twist to the game, as the WW1 historical setting is turned upside down by the crossover with H.G. Wells' imaginative novel "The War of the Worlds." In Tripods & Triplanes, what should be the year the war ends, 1918, becomes the “Year of the Invasion.” Two different generations of Martian Tripods, one more advanced than the other, land on Earth, in two invasion waves. The knights of the air battle against these colossal fighting machines. Players will take control of an awesome Martian Tripod, set upon bringing death and destruction on our planet, or fly the most advanced flying machines created by Mankind during World War One, and try to use them to win the War of the Worlds. 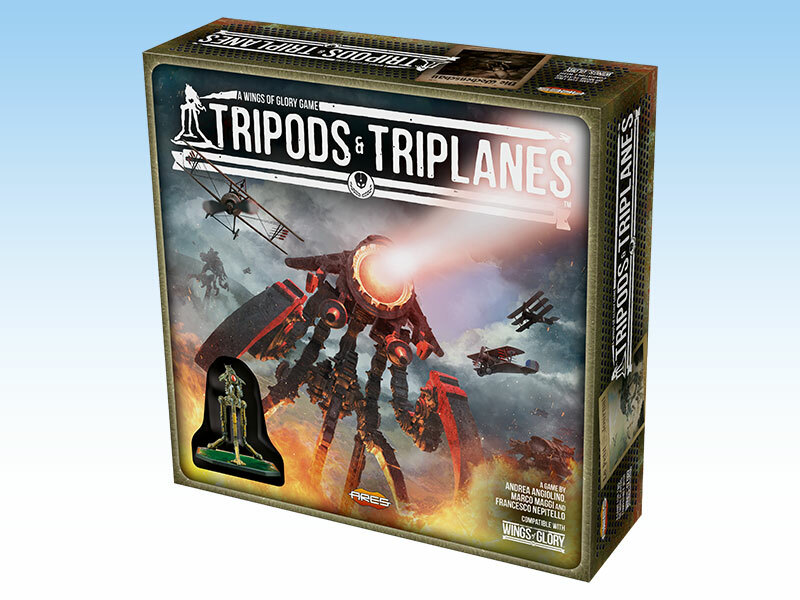 Tripods & Triplanes is a stand-alone game, fully compatible with the WW1 Wings of Glory game line. It's due to release in September, and an advanced prototype presented at Gen Con. At Gen Con 2018, visit Ares Games at booth #335 and in Events Hall A.